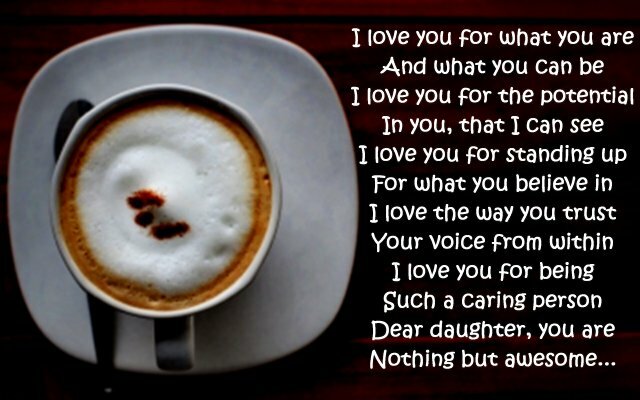 I Love You Poems for Daughter: When was the last time you told your daughter how much you love her? If you are parents to a teenage daughter, write a sweet handwritten note and slip it into her backpack. If you are a daddy to a young independent girl pursuing her dreams, post a cute message on her Facebook. If you are a mom to a daughter who is a mother herself, remind her of all the funny childhood memories by writing a touching rhyme in lovely letter. Watching a little daughter grow up into a beautiful young lady is a pleasure like no other. Life is too fickle to keep waiting for special occasions to express your love with a dull greeting card. Steal every possible opportunity to let your daughter know how much you love being her doting parents.